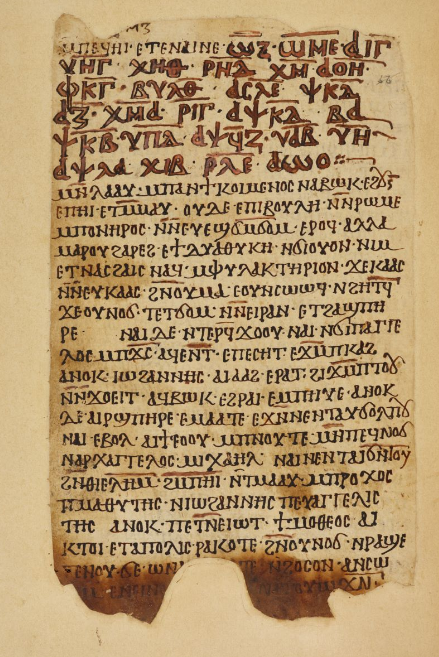 This week we passed a milestone in our project – we finished entering all of the Coptic magical texts known to us into our database, Kyprianos. There is still a lot of work to do – the next stage will be to finish gathering the metadata for these texts, before we seriously begin the process of (re-)editing and analysing them. But to mark this event we’re going to begin a new series of blog posts, Looking at the Coptic Magical Papyri. This series will discuss and analyse the texts themselves – looking descriptively and statistically at the text’s forms, formats and linguistic features. This material will be more slightly technical and papyrological than the other series (which will continue), but we hope that it will still be of interest to some of our readers. In this first post of the new series we will discuss a fairly basic question – how we define and categorise magical texts; this will build upon previous discussions in our posts defining Coptic magic and explaining why we choose to use the term “magic”, but focus on marginal cases. They contain instructions for, or are the result of, private rituals intended to invoke superhuman beings in order to curse, to provoke love, to heal, to protect, or to perform divination. They contain characteristic verbal formulae, such as “I invoke you” or “I adjure you”. Our earlier post also showed an example of a text containing all of these features, but in reality many texts will only contain one or two of them, or will be so fragmentary that we cannot be certain of their original function. In our project, we have chosen to be generous in our definition, marking texts which are less certainly “magical” with a question mark, but still including them as useful comparisons. Exploring the blurry boundaries of “magic” can be an interesting way to examine the concept further. T Louvre inv. 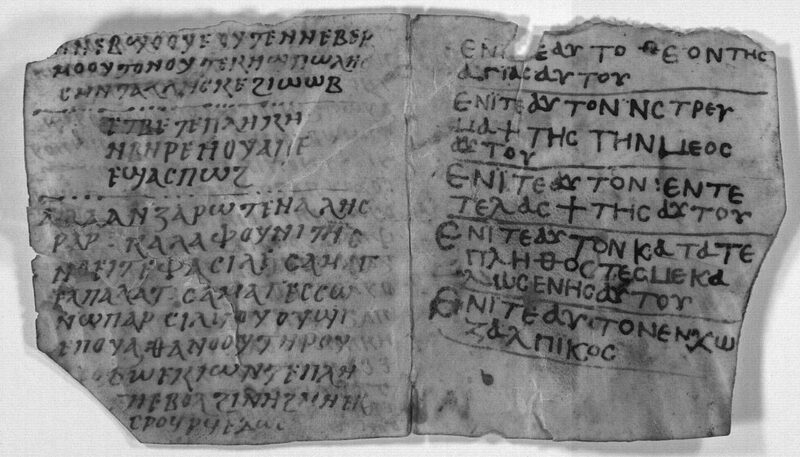 MND 552b (7th century CE, Antinoopolis), a wooden tablet with passages from the Lord’s Prayer written in Greek. Image from Carlig and de Haro Sanchez (2015) who note that it could be understood either as a writing exercise or an amulet hung in a place in order to protect it. One of these blurred boundaries is found in the category of scriptural amulets, which we have already discussed. These consist of copies of parts of Biblical texts (canonical or apocryphal) which were worn on the body or displayed in places that needed protection – homes, workshops, animal pens, and so on. But when we find a short Biblical text on its own, we cannot always be sure that it is an amulet. People learning to write might copy short passages as exercises – often the same ones used on amulets – while others might use them to help with the memorisation of texts. Other examples might also have been used for recitation during Christian liturgies. As many authors, including recently Nathan Carlig and Magali de Haro Sanchez, have pointed out, this means that the function of many texts is very ambiguous. Another fuzzy line exists between “medical” and “magical” texts. In the ancient Mediterranean, as in many other times and places, the line between the two was often very fine, although certain authors, from the Greek Hippocratic School to the orthodox Church Fathers, do seem to have believed that they could in principle be distinguished. Our database includes Coptic “medical” texts, since they are useful for comparison with magical material. “Magical” and “medical” recipes are often found in the same manuscripts, and, in some cases, texts which seem to straddle the division can be categorised as both “medical” and “magical”. According to our rough definition, medical texts are those whose recipes focus only on healing bodily diseases (and not, for example, demonic attacks or the evil eye) by applying physical objects – animal, mineral or vegetable – but not using spoken formulae or performing “magico-religious rituals” like burning incense. In some cases we do find medical handbooks whose recipes correspond exactly to this model, but in others, like Michigan 136, a recipe to treat cuts with honey and pig fat might occur alongside another to cure demonic possession using a written amulet. An interesting anomaly is SB Kopt. I 1, a fragmentary codex dating to the tenth century. The first two surviving pages contain recipes to treat various injuries with salves and plasters. The last page, written in a different hand, contains the first three lines of Psalm 150, which appears on another manuscript which may be an amulet. We might guess that this Psalm was seen as another “recipe”, a divine text which could be copied to create a powerful amulet, as in the cases of other Psalms. But this remains a matter of interpretation – the copyist might have other motivations for writing a Psalm onto the blank pages at the back of a codex. For now, this text is classified as certainly “medical”, and possibly “magical”. A third and final question is the line between magic and literature, something which might not at first be obvious. We might think that magical texts are functional – they aim to do something in the world, whereas literary texts exist to entertain or inspire. But Jacques van der Vliet has pointed out that most surviving Coptic literature had a liturgical function – they are stories of the lives of saints intended to be read aloud during the feasts for those saints or other rituals. As parts of rituals, therefore, literary texts might also be intended to do something. The most interesting example of this found in British Library MS Or. 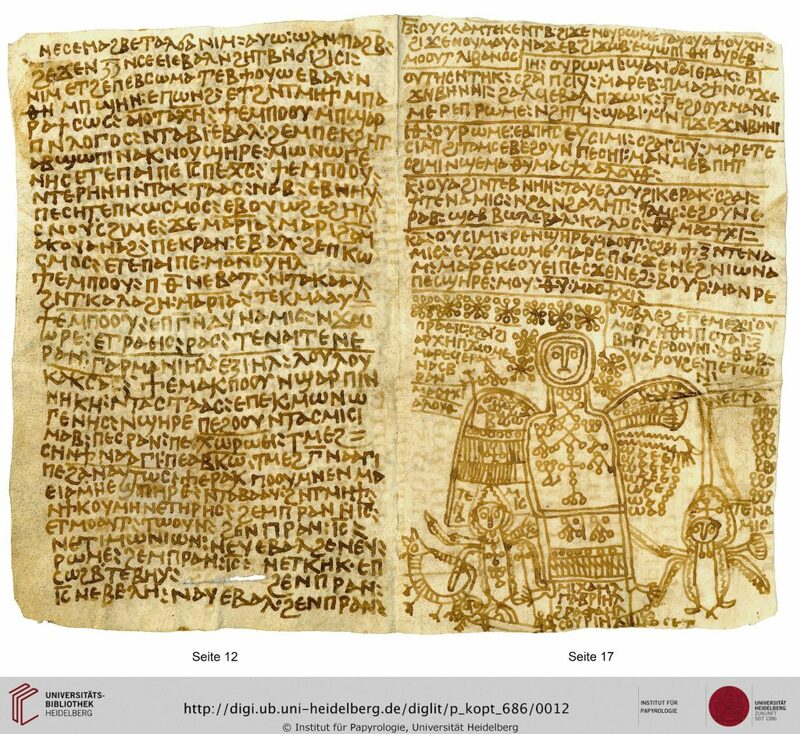 7029, a huge 160-page codex copied in the year 992 CE by a deacon with the wonderful name of Zokrator, which we were alerted to by Matthias Müller. It contains several fascinating texts, including the Life of Aaron, which tells the story of the arrival of Christianity in the island of Philae in the far south of Egypt; a particularly vivid and famous scene involves a monk named Macedonius tricking the pagan priests of the island into letting him behead and burn the sacred falcon worshipped on the island. This is followed by the instructions for the readings for the feast of Apa Aaron, demonstrating that the exciting story was intended to be read as part of a ritual for his commemoration. Most interesting for our study of magic, though, is a later text, a sermon attributed to the Timothy, Patriarch of Alexandria, on the Archangel Michael. The text describes the awe-inspiring powers of the archangel, who can even save sinners from Hell, and is followed by a series of instructions for how to use the names of Michael and the other angels as an amulet, copying them onto the walls of a house, clothing or even cups and dining plates in order to gain supernatural protection against the devil, arrogance and drunkenness. Like the Biblical amulets, these practices were probably not considered “magical” by their users, but they do fit into our “etic” definition of magic: comparing them to more obvious examples of magic tells us something interesting about conceptions of the manipulation of supernatural power in Christian Egypt. These examples, and the blurred lines they highlight between magical texts and school texts, medical recipes, or literary sermons demonstrate the complexity of the category of “Coptic magic”. This diversity creates methodological problems; it is important for us both to remember the great differences which exist within this artificial category, and to take advantage of the ways that material from different contexts can be used to illuminate each other. Editions and translations of several texts from British Library MS Or. 7029, including the Life of Aaron and the Discourse of Timothy on the Archangel Michael. Discussion of the overlaps and possible ways to distinguish magical texts and writing exercises. Dijkstra, Jitse H.F. Philae and the End of Ancient Egyptian Religion: A Regional Study of Religious Transformation (298-642 CE). Orientalia Lovaniensia Analecta, 173. Leuven: Peeters, 2008. Contains an extensive discussion of British Library MS Or. 7029 and the Life of Aaron on pages 225-269. Hasitzka, Monica R. M. Koptisches Sammelbuch, vol. I. (MPER n.s. XXIII/1) (SBKopt I) Vienna: 1993: no. 1. Important checklist of published Coptic magical texts, including a discussion of how to define such texts, which largely corresponds to that presented here. Till, Walter. “Weitere koptische Rezepte”. Le Museon 65 (1952), p. 159-168.
van der Vliet, Jacques.”Literature, Liturgy, Magic: A Dynamic Continuum.” In Christianity in Egypt: Literary Production and Intellectual Trends. Studies in Honor of Tito Orlandi, edited by Paola Buzi and Alberto Camplani. Rome: Institutum Patristicum Augustinianum, 2011, 555-574. An excellent case study of the overlaps between magical, liturgical and literary texts.